Geek-Girl, who starred in a 2016 miniseries, returns in a second miniseries, Geek-Girl Vol. 2. It is written by Geek-Girl creator, Sam Johnson; drawn by Carlos Granda; colored by Chunlin Zhao; and lettered by Paul McLaren. Geek-Girl Vol. 2 #1 (“There's a New Geek in Town”) opens in Acorn Ridge, Maine, in the aftermath of Geek-Girl's battle with Lightning Storm. Ruby is in a coma and taking her place as Geek-Girl is her best friend forever (BFF), Summer. Being Geek-Girl ain't easy, however, and Summer is getting mentored by Maine's other big superhero, “Pit Bull.” Still, Summer is having trouble getting the hang of things, just as a new menace slowly starts to create a power base. THE LOWDOWN: I only read the first issue of the 2016 Geek-Girl miniseries. 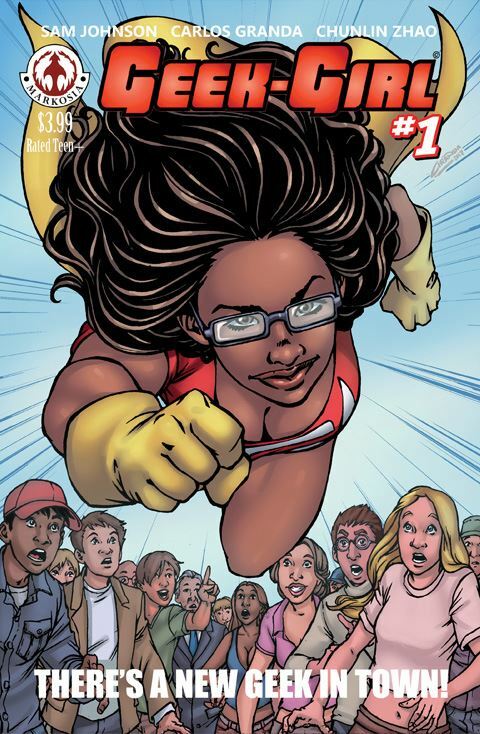 Sam Johnson sent me a PDF review copy of Geek-Girl, Vol. 2 #1, so I wanted to read it because I did see potential in previous series. I must say that I am pleased to see that this Geek-Girl comic book is getting stronger, even as the new Geek-Girl character struggles to get stronger. I was impressed by Carlos Granda on the first mini, and his storytelling and composition are stronger this time around. Granda has to depict Summer/Geek-Girl's trials and tribulations, but he draws her as a vibrant, vivacious character who is ready to pop off the page. Chunlin Zhao's rich colors make Granda's illustrations look even prettier. Sam Johnson's script for Vol. 2's first issue is a little more self-assured than his script for the first issue of the 2016 series. Johnson delves into character and personality and creates drama through that as much as he does through the fight scenes. It all comes through clearly via Paul McLaren's clean lettering and design. Yeah, I still think Geek-Girl will get even better. Geek-Girl Vol. 2 #1's ComiXology page.